Climate activists on both sides of the U.S. and Canadian border are ratcheting up the fight against the Keystone XL tar sands pipeline this week as the U.S. Senate ponders a recently proposed bill that would expedite its approval and “short-circuit” the State Department’s pipeline environmental review . 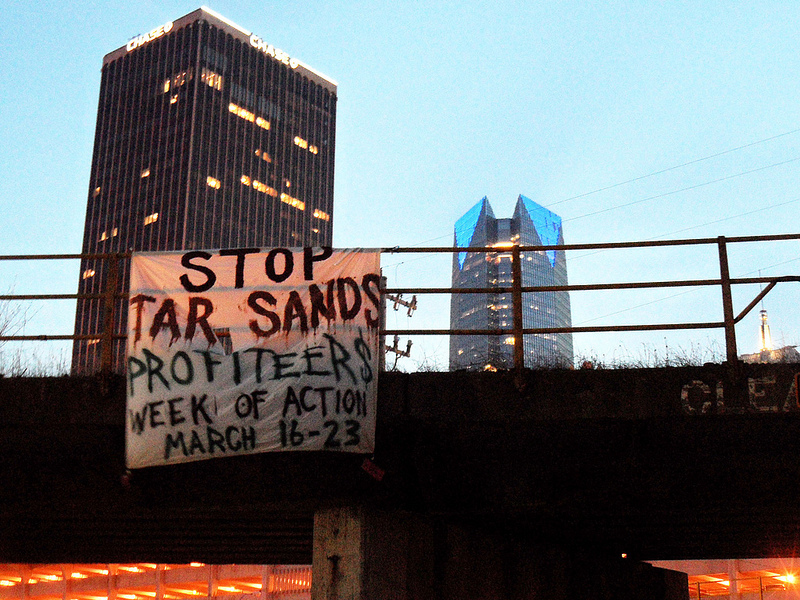 In the past week over 30 protests have taken place in dozens of U.S. cities as part of a ” March 16-23, Week of Action to Stop Tar Sands Profiteers ,” which has been coordinated by over 50 grassroots organizations. So far, thirty-seven protesters have been arrested “for disrupting business as usual at TransCanada and their investors’ offices,” with more actions planned in the coming days. 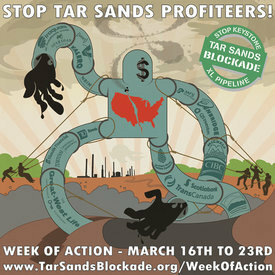 “Organizers seek to expose green-washed corporations like TD Bank, a top shareholder in TransCanada, and force them to divest from the controversial Keystone XL tar sands pipeline,” Tar Sands Blockade stated Wednesday. TD Bank branches have seen protests at multiple locations including three people who were arrested for locking themselves inside a branch office in Washington, DC. Twelve people arrested for blockading a fracking pipeline in upstate New York. Portland, Oregon held a bike tour of the city’s worst polluters including a rally at a TransCanada office. 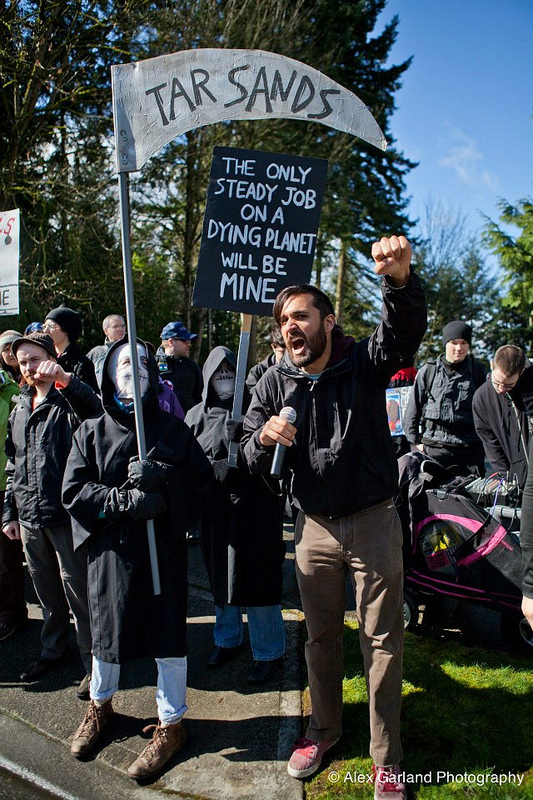 Dozens of activists in grim-reaper garb surround Michels Corporate office in Kirkland, Wash., demanding that Michels stop building KXL. Meanwhile, native leaders from both Canada and the U.S. took to the Canadian Parliament on Wednesday to urge opposition to both the Northern Gateway and Keystone XL pipelines—telling lawmakers that an alliance of native groups on both sides of the border are preparing to fight the pipelines in the courts and through unspecified direct action in the coming months. Chief Allan Adam of the Athabasca Chipewyan First Nation said natives are determined to block the pipelines. “It’s going to be a long, hot summer,” he said at a news conference. “We’re going to stop these pipelines on way or another,” said Phil Lane Jr. of the American Yankton Sioux. “If we have to keep going to court, we’ll keep doing that,” said Chief Martin Louie of the Nadleh Whut’en First Nation in northern B.C., adding that pipeline opponents will never back down. “We’re the ones that’s going to save whatever we have left of this Earth,” he said. More actions are expected throughout the U.S. in the coming days including six more actions against TD Bank in New York City, Washington D.C., Montpellier, Vt., Newark, Del., New Haven, Conn., and Asheville, N.C., Tar Sands Blockade reports. Click Here for a full list of actions and live updates from around the country.